Video Games are an Exciting New Step for Storytelling! Let me start off by saying that I am a huge fan of video games. The adventure and role play genres are my favorite. And because of my enthusiasm for video games, I believe they are far more than what people define them these days- that they are a waste of time and promote lack of productivity. The first thing that comes to some peoples’ minds about video games, is that they are merely about mindless shooting and that only boys/children play them (don’t be surprised that I’m a female who enjoys playing ps4 and Grand Theft Auto!). But in fact, video games are an imagination engine and can even be inspirational, much like a book. What video games have reached is a middle-ground between books and movies, borrowing elements from both sides to intertwine narrative and visual storytelling. Unlike movies and books where the story is told as a sequence of events, games give you an avenue to discover the story on your own path. There’ve been endless debates about games in general. Common debates revolve around the question of “Do games shape or influence your personality?” or if they contribute to breeding violent behaviors in children. This is definitely not going to be another one of those topics. 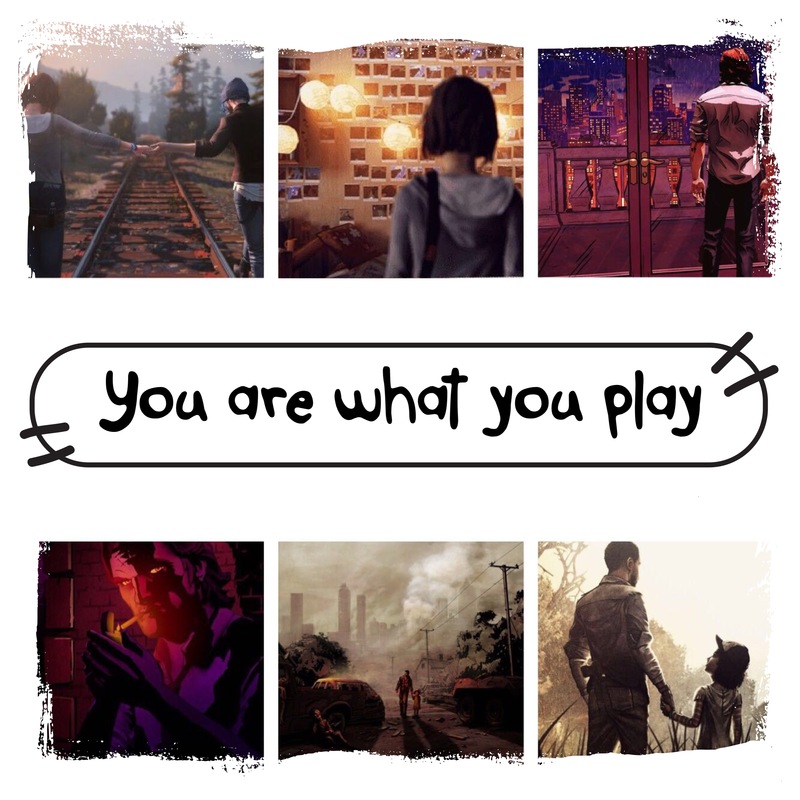 Instead, I would like to switch up it up by delving into a question that is equally, if not more so, interesting but has not been gaining much attention- Does your personality influence the types of games you play and how you play them? Seeing how a variety of “Choice” games are being introduced into the world of gameplay, this is an intriguing topic to bring up. The gamescape is now filled with personality and moving stories to tell in which you empathize with the characters and place yourself in their shoes. A prime example are “Telltale” games that employ deep narratives to create an immersive gaming experience for players. Games like “The Walking Dead”, “Life is Strange”, “The Wolf Among us” and other fantastic game narratives like Heavy Rain and Red Dead Redemption, have set the foundation for the art of storytelling in the realm of video games. Introducing story-driven games that are interactive and engaging have paved the way for so much potential in this medium, one that is akin to movies in the way they tell stories. Except in video games you have the ability to control the flow of the story and how it unfolds as you play. You are placed in a position to contemplate what choices and decisions you should make, and be left wondering whether they are going to leave a good or bad impact and outcome on your character’s destiny. It’s not mindless gaming anymore, for me, its about the storyline that connects you to the game on a deeper level. A story that is molded by me. What other mediums allow for this type of experience? Video games! The choices made in gaming aren’t just plain decisions. Emotionally gripping plots involve meaningful decisions that leave an imprint on you long after you finish the games’ story. During an apocalypse, would you loot an abandoned car left there with supplies all for the taking and leave the owners (possibly a family) of the car empty-handed and starved, or would you choose to steal the supplies and help yourself and your team survive? Should you save the friend who just stumbled and fell as you are chased by a horde of zombies in pursuit behind you, hence holding back the group and facing the possibility of being devoured, or leave him behind and saving your self and others from the danger? Would you have the guts to shoot a child who has succumbed to a zombie bite to prevent him from turning or should you leave him there to endure the pain? The game is fraught with such deliberation that must be made in a span of a few seconds. Sometimes you pause to think what you would do in a similar real-life situation and it leaves you conflicted, usually resulting in being put under pressure and questioning which decision is the right one. After I was done playing The Walking Dead, I found myself attached to the protagonist because the character appealed to my emotional core. The main character finds a little girl whose parents have left on the weekend the apocalypse hits and the game begins to explore what it means to become a guardian for this girl, and its up to you to decide how to go about it. When I first started playing the game, I was expecting another dramatic zombie survival game. But what was challenging was not catching a zombie coming your way and in panic clicking the wrong button as a result of a knee jerk reaction. The challenge is when certain characters elicit instincts in you, be it protection of other characters in the game or choosing who to emphasize with more, hence making some tough decisions. The more you play, the more the world set in the game becomes alive through its richness and intricacy and the more believable the characters become. There are no levels and no rewards, you just progress through the story as you unlock mysteries and solve clues, like a storytelling puzzle that concludes with a nice experience. The question is, do personality traits drive certain choices within the game? They certainly do. As in real-life, our personality influences the choices we make. So far, this question requires more research and studies have already identified that Neuroticism, Extraversion, Openness,Conscientiousness and Agreeableness are 5 personality characteristics that influence your gameplay be it your role in the game (good guy, or bad guy?) or the genre you enjoy most. It is also worth noting that mood plays a big role as well. Good stories can come from anywhere; book, films, games. Video games are another mode of media with a potential to tell beautiful and compelling stories in a fantasy world of amazing visual effects and unique, imaginative characters that are changing the perceptions of gaming. But what it has to its advantage is giving the player the power of control and influence in the story. It’s just another adventure with many worlds to explore and most importantly its an emerging art form that still has a lot in store! Previous PostMearmisha, for shawarma on the go!